Homeschooling is like anything else–a great opportunity for people to make money on all sorts of curriculum. And I’m all about the opportunity to make money! But every now and then I talk to moms who are financially strapped but still feel the pressure to invest in lots of curriculum. Or, I hear from moms who say they would like to come home and homeschool, but if their income was cut, they wouldn’t be able to afford school materials, assuming that’s the only way to do it. The good news is you can truly homeschool without spending any money. The Internet has opened up a whole new world of possibilities for education. It will require a bit more work, but not as much as you might think. AND, because we are just accustomed to the neat, colorful packages of curriculum, it’s hard for us to think of not having it. The truth is, really, (and we know it), that learning doesn’t require anything fancy or pre-packaged and can be quite fun and creative! Since we discovered the idea of relaxed homeschooling, our lives are so enriched and much more stress-free. First, make sure you remember the goal of homeschooling: to educate, not to get finished with a text book. Getting through a grade level of curriculum is only important if they learn the material. Finishing isn’t the goal, learning about life is. Education: the transfer of a way of life. The beauty of homeschooling! If you really want to stay right on track with their schooled counterparts, you can look on line or in text books to see what other children are learning and when. However, keep in mind that your children will not be handicapped if they learn about the Civil War in the second grace but don’t know what barometric pressure is until the 8th. One time table, established by the state schools, is just one time table–not necessarily the “right” one. If they are learning, they are being educated in the right direction. Start a running book list and use your library and ask friends if you can borrow/barter with them. Books are your foundation. Ambleside is a great place to start compiling your list. Also, there are many, many free on-line books now, so check The Online Books Page and sites like that for free versions. For little ones, math is easy. It’s all around us every day–just remember, instead of taking what is so natural to us for granted, talk through it as you see opportunities (time, measurements, adding and subtracting). For elementary/middle school math, Math Worksheets Land, with free worksheets, is wonderful. You could even print these off and create your own text book. Chalkboards are GREAT for teaching little ones letters and sounds. They seem to be motivated more by a chalkboard than just a piece of paper, though that works great too! I’ve heard of making peanut butter playdoh letters, and all sorts of other ideas too. Teaching children to read is so much more simple than I once thought–sounds of letters, then put letters together, then words–that’s it. Nothing fancy required. Check out Donna Young’s Printables and Resource for a wealth of help! I’ve also used the Flapbook idea to teach reading, writing letter blends on one flap then the ending of the word on another and teaching one side at a time. Reading great biographies with a few resource books on hand can supply a rich education of social studies, geography and history. Add essays for older students and if you don’t feel confident enough to grade them, barter with a friend who can. We have found that trivia games of all sorts provide a really great spring board for sparking interest and further studies. We are currently spending a few minutes in the afternoon while I ask trivia questions from a National Geographic game. We learn facts, but it also opens up doors and then they end up discussing things they learned with Dad around the dinner table. The discussion is the gem. We don’t talk enough about the importance of learning life skills. There are obvious ones like learning to run a household (and so many kids miss these, despite how obvious!) and there are all sorts of other opportunities like working alongside your husband or neighbor as he builds a deck where he will learn not just the skill, but the educational application as well (measurements, fractions, equations). In the big picture of life, I would venture to say that learning practical skills is EVERY BIT important as gaining an intellectual education, but so often ignored. (I may have to revisit this topic in a post of its own!) So hand that kid a screwdriver and put him to work! Before you begin. I would be remiss if I didn’t emphasize that for Christians, we MUST begin with “the fear of the Lord is the beginning of knowledge.” It’s so easy to get swept along by what others expect of us, and neglect our greatest duty in education. Our children will be so far ahead by simply teaching from this simple starting place. And besides that, it’s our command! I have just created a new homeschooling website–HOMESCHOOL SIMPLY–with lots of great freebies and ideas. You should really check it out! 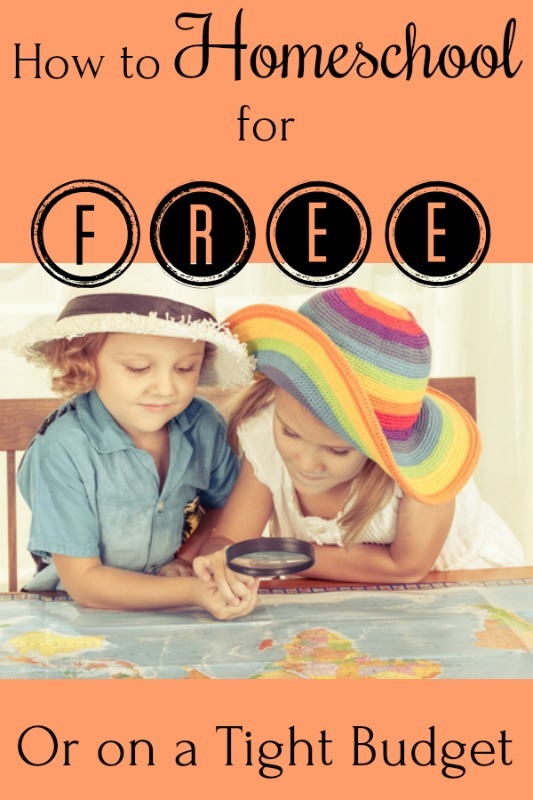 Easy Peasy All-in-One Homeschooling–a complete and FREE website for schooling K-12! Khan Academy–Just about every subject you can imagine, free, and simple. If this was your only resource, it would be more than enough. Crash Course–I love this YouTube channel. Lots of difficult to understand topics made fun and interesting. National Geographic–so much visual stimuli–sure to spark imaginations! These are just a few things–only the beginning. When you realize that education is about the learning–not the text book, you will begin to see opportunities all around you for educating your children…and yourself, maybe for the first time! Yes! I am always amazed at the amount many homeschoolers set aside for curriculum each year. I seriously had a budget of $200 every year when my kids were younger, when most of my friends were saving 10x that much. (However, that may have included extra curricular lessons or something?). I would add to your list the use of the local library. It is invaluable in our home! Especially if you have access to a larger city circulation, there is virtually nothing you can’t find. I am also a BIG half.com and Amazon-used fan. When you can get books for a fraction of the price that may have been gently used (yet many times, brand new) why pay full price? Almost all of my book purchasing comes from either of those places or Ebay. 1. http://www.khanacademy.org/ Salmar Khan’s site is known more and more for his free, short, effective lessons in math (addition up to advanced calculus), but he offers many courses – all in 10 min youtube videos. Thank you for sharing the Khan website! This will be so helpful for our upcoming school year! If you haven’t looked at Khan Academy recently, he has added math practice to the site. Kids can work through all the math topics doing practice sets until they get 10 in a row correct (a “streak”) and get a little online star award. Even if they can’t get 10 in a row right, they can get “persistence” awards for doing 30 or 40 or whatever “mostly right”. There is a nice flow-chart that shows them how much progress they are making, and how many awards they have earned. My kids have been working on this for the last few weeks & they think it’s much more fun than their regular math. It’s really the first child that has the highest cost. If one uses looseleaf in folders/notebooks-even workbooks(Modern Curriculum Press math at Christian Liberty Press) can be passed down to the younger children.Hardcover books(science,etc.) at Rod and Staff(the readers have phonics workbbooks) last a long time. I just ordered The Reading Lesson($22) from Timberdoodle for our soon-to-be 4-year-old granddaughter and if we like it we can use it for the younger granddaughters(we just found out we are having our fifth granddaughter in June). The Rod and Staff readers,Christian Light readers, the McGuffey Readers and the Amish Pathway Readers(ordered at Timberdoodle-I omitted one story in a reader-First Steps) are all hardcover. Thanks for sharing. All the curriculum talk can get overwhelming for people who are still considering or unsure about homeschooling. I think you’re right that the “skills” part can’t be overstated. Kids respond so much better to teaching when they see practical applications. I’ve started using grocery shopping to practice 1st grade math with our daughter who’s struggling because she responds better than sitting her down with extra worksheets. I also now consciously point out how we use math and reading on the farm for research, measuring out food and meds, building shelters, etc. They’re so much more receptive when they are out DOING something. Another tip I got from a friend – if you do want to invest in workbooks, also buy some trasnparecy sheets (like you use w/ an overhead projector). The child just lays the sheet over the workbook page and does the assignment w/ a dry-earase marker. If you’re concerned about keeping records just snap a photo of it to keep in a digital file. Then wipe the transparency clean for the next lesson, and your workbooks will still be useable for the next child (like getting that book free again!). This is especially useful since publishers will tweak things for subsequent editions, so when you go to get the same workbook for the same textbook, for the next child, it might be discontinued. Lori, this is a great tip! Thank you, Kelly, for all of the great ideas. True – we can do a LOT with what we already have! There are some though that haven’t been homeschooled, or don’t have any idea even where to begin, and I have to say that there are times when it is nice to open a book and have someone share their ideas and thoughts. I know you know, but for your readers, I began putting down ideas for what I wanted to teach my children many years ago – mainly because I like to see what I’m going to do. I began with the letter and number, and started finding relating information in the Bible – so we learned ‘school’ stuff AND Bible lessons. For anyone interested in ‘guides’ that give you ideas for teaching preschoolers up to kindergarten, I’d encourage you to visit http://sonbeams.com/homeschool-preschool-curriculum.html . If you like what you see, contact me through the form on the website and tell me you saw this here, and I’ll give you a 25% discount on the homeschool materials on this page! Oh, and these lessons are a lot like Sunday School lessons – each week the letter, color or shape, and number lessons tie into the same main Bible memory verse – plus you’ll have other verses on other days that tie in with the lessons as well. Thank you for this post and for the great links. I will go back and read more this weekend. Thank you for your ministry here. This is a really good post, and the comments are highly useful as well. I’m curious about one thing, however: If a home-schooled child needs ‘special’ educational resources, such as books on tape or in large print; or additional services, such as occupational therapy, are there cost-effective ways to secure these items for cash-strapped homeschoolers? Depending on which state you live in, there are often public school services such as you’ve mentioned available to homeschoolers. where she has free lesson plans for dyslexic kids, those with writing glitches or a combo. I make my own flashcards based on the word lists in the Secret Stories reading guide. This book is pretty pricey($80) but it’s worth it if you’ve tried everything to get your child to read and it’s not happening. Those are helpful in the Dianne Craft lesson plans. The Straight Talk Speech program is good for ironing out pronunciation problems and costs $40-50. This is a wonderful option if you don’t want to drag your whole crew out to the public school once a week for speech therapy. While some of these items might seem expensive, when you factor in that they can be reused and that private tutoring of reading problems this very costly, it is most definitely worth it. I love http://www.abebooks.com/ to find books cheaper than Amazon dealers 8 times out of 10. And also homeschool materials here. But my best finds have been at Homeschool used book sales. Some homeschool support groups offer one every year. Craigslist has been another resource that I have gotten curriculum for very cheap. There is a free science curriculum here for Kindergarten, he hopes that you will fall in love and buy subsequent years later. Free online science experiments here. Hi Mommy4, I didn’t see the link for the free kindergarten science curriculum, but that was the one I was interested in. Would you mind posting that link? Thanks!! I home educated my oldest daughter(now 28) for kindergarten and first grade then put her in the government school for 2nd-4th where she was in special ed(autism spectrum).The teachers said if I didn’t home educate Jessica for K-1st that she would not have been such a great reader because she needs the one-on-one teaching. Her two older brothers- who also home educated in the younger grades were on the bus with her.When my son was too old to be on the elementary bus with her we started homeschooling again. I researched occupational therapy and had been friendly with the O.T. teacher-ordered and used the occupational-therapy books(I’m sure they’re in the library) besides the homeschooling books(she was the only one of our 6 children that liked BJUP spelling books and D’Nealian penmanship- she’s a great speller and has great penmanship). She now attends a day program(since 18) and moved into a nearby group home a few years ago(after being on a waiting list). Do you know the “freebie of the day”? They are Christians and offer 1 free resource Mo-Fr. they are both e-books and also audiofiles with all kinds of issues and subjetcs. I agree!! I have used the SECRET STORIES with all three of my kids, and it just makes teaching those critical reading & writing skills across the elementary grade levels SOOO EASYYY!! !